Why Is Hitting a Car Still Considered More Serious Than Hitting a Person? On Sunday, July 28, I was playing in the back yard with Sammy when we heard a horrible sound of twisting metal come from the front of the house. Grabbing my phone, I ran out of the house to see if anyone was hurt in what was surely another car crash at the corner of Federal and National. A dazed looking man wobbled out of a truck, and a less woozy looking man was already out of his car walking over to the truck. Not seeing anyone on the phone yet, I pulled mine and called 911. Moments later, I heard sirens. When the firetrucks arrived, I went back in the house. Everyone was fine and the authorities arrived. Later that night, an LAPD investigator called me back wanting to know if I had witnessed the crash. I had not. He thanked me for calling and I wished him luck. To their credit, the LAPD was taking the crash seriously. Good for them. Sadly, this doesn’t happen everytime there is a crash. At Biking in L.A., Ted Rogers recounts the story a Melanie Freeland, a bicyclist that was hit by a car earlier this week right in front of two LAPD officers. While both officers agreed that the vehicle driver made an illegal turn, the Department is not issuing a ticket. The frustrated cyclist followed up with the LAPD on the phone and immediately after the crash, but can’t get the Department to take her case seriously. I called the Central Traffic Division and asked to speak with the Watch Commander on duty yesterday. As I probably should have guessed it was [the Sergeant she’d spoken to at the scene]. I explained to her my phone conversation with [the desk officer] and she stated she did not know why he would state it was a rear end incident when it wasn’t. We talked at length about why a citation would not be issued for this offense. She stated that in order for a traffic citation to be issued two criteria must be met. 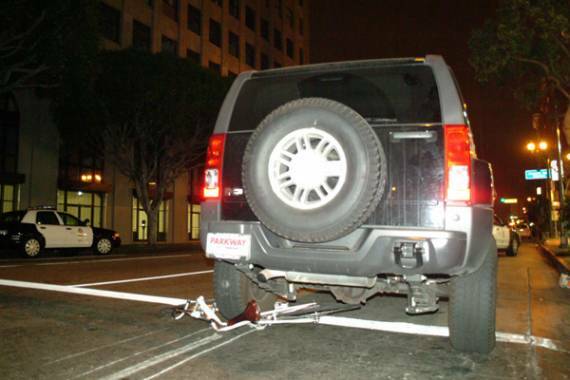 An LAPD officer must witness the incident and be trained in traffic laws (taken the special course in traffic). Because the [traffic officer] didn’t witness the incident it did not meet the two criteria. Secondly, the officer who did witness the incident is not trained in traffic laws, so again it does not meet the criteria. Thus it is now my understanding, due to the letter of the law that it is not possible for the LAPD to issue a citation to the driver who hit me. It’s 2013. It’s been three years since the LAPD decided to start riding along on Critical Mass. The LAPD Bicycle Task Force has been meeting for nearly five years. We shouldn’t still be fighting for the police to take it seriously when a car breaks a law and hits someone. On July 28, the LAPD was clearly investigating a crash that no LAPD officer witnessed. On August 28, they pleaded helplessness when a car hit a bicyclist, despite two officers witnessing the crash. Why is it so hard to get them to do the same when cops do witness it, just because the scofflaw driver hit an unprotected cyclist and not a protected driver? More than anything, this is what Los Angeles needs to change before it can ever be considered a bicycle friendly city. I think there’s a difference between writing up/filing a police report and actually issuing a citation or investigating the crash. The police have to file a report about every accident so that the insurance companies have an official record. These reports often include whether anyone witnessed the crash and what they said about the crash. It sounds like the police person who called you was looking for a witness to include in the report. I assume that Ms. Freeland also got a police report filed as a result of the crash. Filing a police report doesn’t mean that the police will do anything else for you. Imagine if I used a sword or staff to swing into the path of pedestrians on the sidewalk, missing them by a foot or two. What would happen? I’d be arrested most likely. Yet if I did the same thing using a car, if nothing would happen. Just the other day while crossing 1st street (at the midblock crosswalk governed by a light) in Little Tokyo a car ran a red and passed me with less than a foot to spare. This occurred when I was already in the middle of the right lane, the motorist moved into the oncomming lane to get around me. This happened after I had already yielded my right of way to a couple of motorists who couldn’t be bothered to stop for the red light. The LAPD was sitting right there and when I gave them a “did you see that” look the response I got was the look of hatred and hostility. Everyday I see cops ignore illegal, dangerous and theoretically ticketable offenses against pedestrians and cyclists. It seems that even enforcing the law around crosswalks in front grade schools isn’t a part of their job description. The police work on the behalf of the insurance industry, so they’re only concerned when when somebody needs to file a claim for substantial body work. LAPD is lying. The LAPD is authorized by law to issue citations based on any credible witness’s testimony. This nonsense about “an LAPD officer trained in traffic laws must witness the incident” is just something the LAPD made up so that they could let drivers kill people. Because the higher-ups at the LAPD like to kill pedestrians and cyclists; they’ve made it very clear. the police actually do NOT file a report for every accident. In fact they will only file a report if there is an injury. Who Acted Worse? The Hummer Driver or the LAPD?